Raised Access Flooring poses unique challenges in the areas of cleaning and maintenance. Soil and grit removed from the surface must be completely removed to maintain the ease of lifting tiles. Further, cleaning and polishing liquids used in the process must not be allowed to penetrate beneath the floor system to underlying utilities. 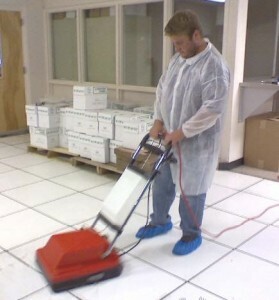 Smart Space Solutions has the knowledge, experience, and specialized equipment to keep your raised floor clean and functioning properly. Periodic cleaning above and below the floor will protect the equipment and utilities that are critical to your company’s operation and help to maintain better indoor air quality. No matter the size of your facility, Smart Space Solutions will help insure a healthy environment for both your equipment and employees.